Samsung has started pushing out the Android 4.1.2 Jelly Bean update to the Galaxy Note 2. It's only reached Poland so far, according to the table over at SamMobile, but is rolling out in phases. So keep hitting the update button and hopefully you should see it soon enough. So what's new? Well there's a host of new features. You get new additions in Notification Toggles, you can customise the Notifications Panel, and the brightness slider in the Notifications Panel can be disabled. Multi-View can be disabled as well, the browser is smoother than before, and the Status Bar is now black instead of grey. You can type on the keyboard just by dragging your finger across it (like Swype or Android 4.2 Jelly Bean), there's a new ink effect on the lockscreen, as well as a new Group Cast app. So no world-changing features, admittedly, but they all count. 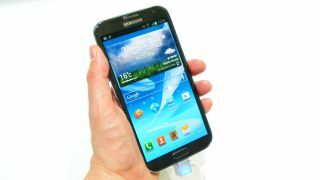 Samsung recently started rolling out the same update to the Galaxy S3 smartphone. The Galaxy Note 2 is one of Samsung's flagship devices, along with the S3, so it obviously wants to keep both up to date. Neither have Android 4.2 Jelly Bean yet though, as found on the Nexus 4.